Have you ever laid down and really looked at the moss under your feet? The little star-like patterns that form the dense carpet, or the dazzling dewdrops suspended on the reproductive stalks? When I walk barefoot in these glowing green woods I can't help but feel like I am walking on a lush carpet of miracles. Mosses were the first plants to conquer land, changing the landscape dramatically and settling into nearly every ecosystem on Earth. They are the first bits of green I see each spring after a cold, white winter. They bring the hope of an awakening earth and the comforting constancy of an organism that has been alive far beyond my human understanding of time can envision. This cake is representative of a Pacific Northwest take on the Japanese tradition of “Hanami,” tree-blossom observing. Instead of reminding us of the frailty of life through ethereal blossoms, moss reminds us of the constancy of life through ancient plants. Mosses have been here far longer than humans have existed, and some of their patches can be hundreds of years old. Those little dew-covered sparks and mossy beds have guarded over their forests for longer than I have been alive. So when life gets overwhelming and my problems seem larger than myself, I escape into the woods and practice the art of moss-gazing. I’d love it if you joined me: make a point to notice the minute and the tiny; the dramatic landscapes found within the soft carpet of moss underfoot and the diversity of flavors hidden under a decaying log. Just remember, if you’re having trouble seeing the big picture, just look closer. I’m also honored to mention that this recipe (as well as some of my other work) has appeared in the most recent issue of Faerie Magazine, one of my absolute favorite magazines to dive into and explore. The theme of this issue is “Tolkien Magic” and it is full of just that, with feasts for hobbits, beautiful photography of elves, gorgeous woodcarvings, articles about Tolkien himself, and so much more. I can’t tell you how much I enjoyed diving into the magical world that this magazine provides. I’m so honored to be included in it and have the chance to share my magic with others as well! You can find it on their website, or at many book retailers including Barnes and Noble. 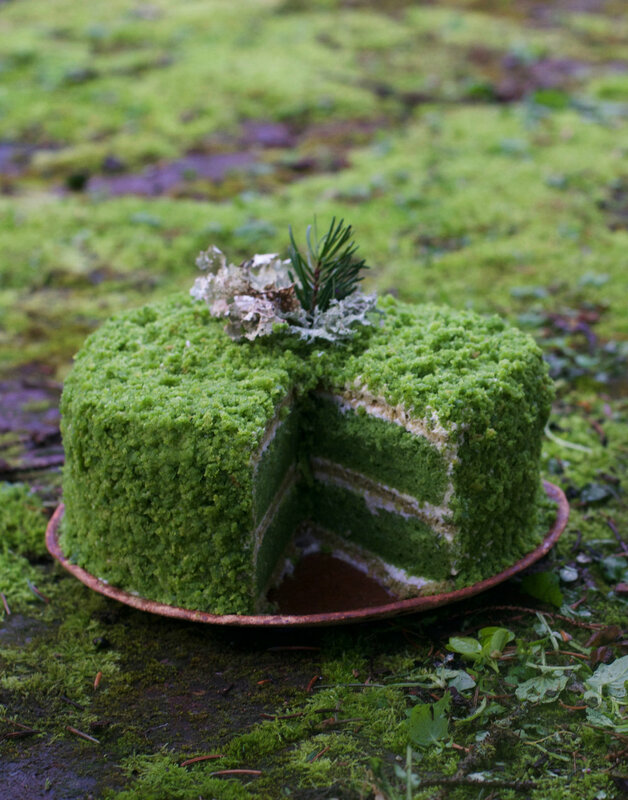 And you can find the moss cake recipe in it too, though I’m also sharing it here for those who don’t subscribe to Faerie. Cheers!